A semester school that inspires environmental stewardship. 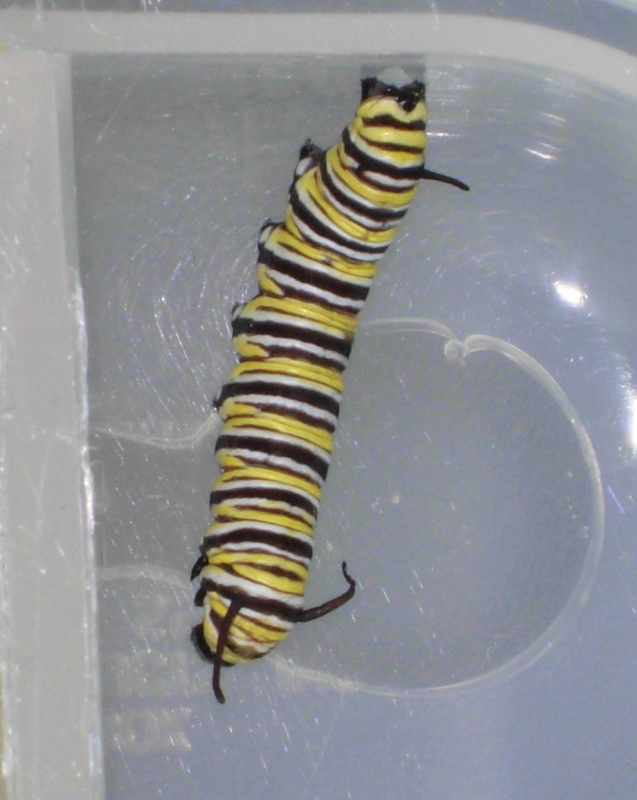 One of the monarch larvae currently residing in a Conserve School science lab. Conserve School is participating in a collaboration between NASA and the University of Kansas that links science classes across the country with a research experiment on the International Space Station. The November shuttle launch carried three monarch caterpillars into space in order to investigate the effects of microgravity on metamorphosis. The University of Kansas Entomology Department has paired up with NASA to provide schools with monarch larvae, educational materials, and rearing chambers much like those used on the space station. Photographs and videos of the developing astro-monarchs are downloaded daily and made available on-line so that students can compare the development of their own monarchs with their counterparts in space. 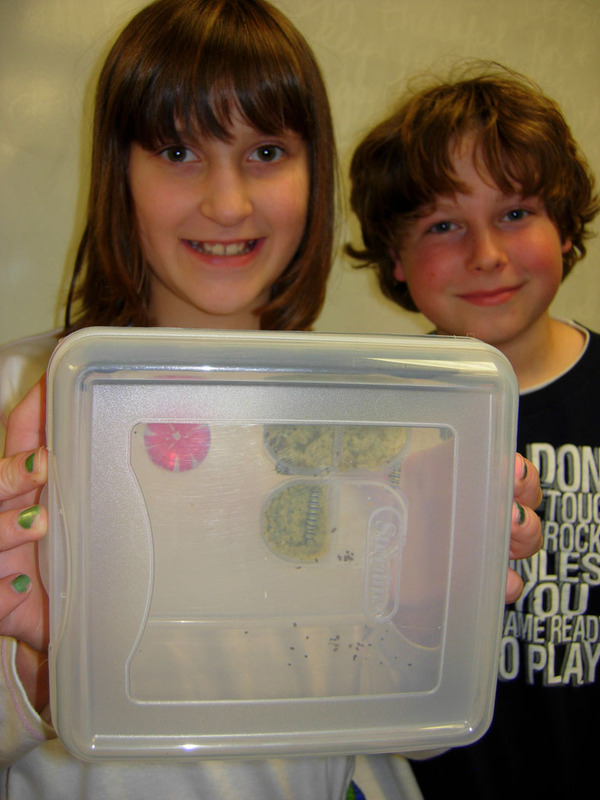 Land O' Lakes 5th graders show off their caterpillars and habitat. Every summer we monitor monarch activity in our butterfly garden and collect and raise monarch larvae for a University of Minnesota research project, so we couldn’t resist getting in on this research opportunity, too. One of our science labs is now home to two monarch caterpillars, both of which are at this moment transforming into chrysalises. We’re sharing our experience with nearby Land O’ Lakes Elementary School by providing fifth graders with materials and guidance as they raise three of the monarch larvae we received. All of the space caterpillars — or, as the 5th graders refer to them, caterpillarnauts –have formed what appear to be normal chrysalises, with one catch. 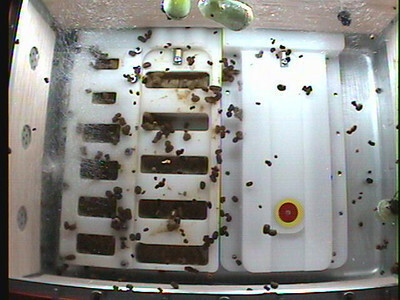 Instead of being anchored to the wall of the rearing chamber, as they would be on Earth, two of the chrysalises are floating freely in the weightless environment, as you can see in the photo below. If you are interested in following the research project, go to the University of Kansas Monarchs in Space website for complete information. The space butterflies are expected to emerge this Thursday. Click on the photo below to go directly to videos and photos downloaded from the space station. Science Teacher Robert Eady set up a video camera to record short video segments of the caterpillars every few minutes, paralleling how video clips are being taken on the space station. Students in Science Teacher Andy Milbauer’s Applied Ecology and Environmental Monitoring classes will use the clips to create a video of the monarchs’ development. How will the butterflies survive in snowy Wisconsin? The kit from the University of Kansas includes an artifical nectar feeder. According to the instructions, the butterflies can live out their natural lifespan on a diet of Gatorade.